Panther Parent Academy is an adult education program for Parson Hills Elementary parents that seeks to inform, equip and come alongside families to advocate for their overall economic, social and personal well-being. When Camp War Eagle’s After School Program, SOAR, expanded to Parson Hills Elementary in 2015 part of the vision for expanding and growing was to kickstart a program for the families of our kids and the school. During SOAR’s involvement with Jones Elementary, we came alongside an existing program that the school was running called Parent University. Parent University, or P.U. a weekly opportunity that incentivized parental involvement in classes and topic studies relevant to them culturally, economically and socially. P.U. started with the efforts of Principal Melissa Fink and other Jones teachers. The partnership with SOAR and P.U. 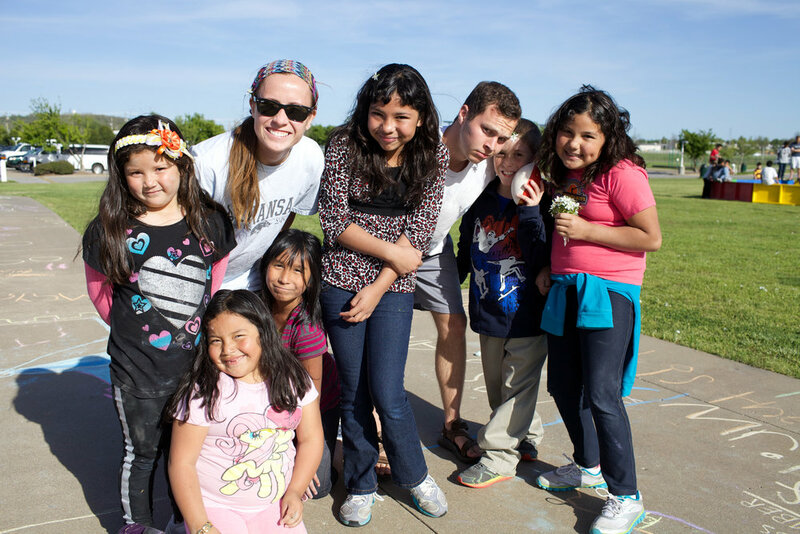 led to unique opportunities for deeper partnerships with Camp and the school and strengthened or created relationships that had never before been accessed by our organization. As a summer camp and an after-school program there is limited interactions with the families of the kids we set out to serve, so this development was indeed unmapped wilderness for Camp War Eagle. It prompted discussion for the new SOAR sight at Parson Hills, which was well funded by the Walton Family Foundation and a 21CCLC grant through the state, to have an element of its program be specifically dedicated to engaging the families of the school. That led to the Parson Hills site starting what we now call Panther Parent Academy, or P.P.A. The goal of the program is to connect on a personal level with Parson Hills families, and especially those of our SOAR families through weekly gatherings where we facilitate adult classes about cultural, financial and personal issues, provide childcare and offer a family-style dinner. We have partnered with organizations all over the area like Freedom5one, Art Feeds, Team Springdale, The Jones Center, the Springdale Police Department and Springdale Schools. Principal Heather Cooper, who came to the school four years ago, said it has been difficult to form much or any kind of parent involvement outside of what is mandatory. So when SOAR brought the idea to Mrs. Cooper she was thrilled about the possibilities it would create for the parents to get involved in something that could further the school’s relationships and opportunities for the families. In previous sessions we have covered things like personal health and wellness and partnered with the school nurse and UofA med students, we also did a miniseries on safety and awareness and brought in the school’s resource officer to give a presentation on gang awareness and even did a miniseries with Freedom 51 on personal finance and budgeting. This semester we are doing a series inspired by a very successful class at Jones Elementary P.U. called ‘pathway to graduation’ where we bring in guidance counselors from the proceeding schools our Parson Hills students will feed into to talk about the specifics of that grade level. Whether it be emotional health and wellness, athletic or extracurricular opportunities, or how parents can be involved we are covering it from middle school all the way to their college experience. We also break up these classes with nights of pure fun for the whole family to let loose and have a good time with each other! The most recent one we had was a family BINGO night that was held in the school’s library. We had over 70 people in attendance- some who had never played BINGO before! It was a night full of pizza, prizes and giggles and something that is on the verge of becoming a tradition. The program is small but growing and we are learning just how much these families care not only about themselves and their own well-being, but that of their kids and we are so grateful for a place to partner with them- we are excited for the coming weeks and years of this partnership! "Bingo!" Mr. Javier yelled from his table in the back. He had won his first Bingo game. EVER. He had never heard of Bingo. He had no clue what he was getting himself into when his two children had begged him to stay for family bingo night. He had no clue when he said "yes" to his children; and let alone, he had no idea he'd have beginner's luck and win a prize. On September 21st we had our first family event of the year at the Jones Center. I had advertised one week in advance and had personally invited families to attend just a couple of days before Bingo Night. I greeted them and reminded them to join us for a night of food, family, and fun hoping to encourage them to come. I had four families that signed up, totaling my numbers up to twenty, and families that verbally told me they would come. I was nervous but very excited to see the outcome for the following day. It was finally the day of Family Bingo Night. I was so distressed and worried, especially since I have never had a family event that was specific only to SOAR families, and held in our own program area. I feared that no families would show up and the prizes and pizza I had bought would be a total waste. My mind was in a hundred places at once and my discouraged heart clouded my judgment and my thoughts. A half hour before we kicked off our family night, I distracted myself with clearing bingo boards, finding plates and napkins, and putting the prizes together. (When I am nervous and discouraged, I tend to fidget and distract myself with small busy work.) My colleague, the director of the program, called me out and redirected me to reality. She told me to leave the busy work to her and for me to go get ready to greet families thatwill show up. I repeated that in my head, "will show up, will show up, will show up." And boy, am I forever grateful for her ambitious heart. She saw the positive outcome, and I was only looking at the worst outcome. I let my doubtful heart get the best of me so I chose to rid myself of negative thoughts and I heard a voice telling me "So what if you only have 1-5 people show up? Sit with them. Laugh with them. Play bingo with them. Love them." I made my way to the front desk as the last families were checking out of the program. I had one family waiting in the hall and asked them if they were staying and they said "Yes!" There was four of them in the family! My heart leapt for joy and I directed them to the program area. Shortly after, I saw two of our students with their father saying "please, can we stay?" I then went up to Mr. Javier, shook his hand firmly, smiled, and asked how he was and if he'd like to play bingo. He nodded yes and his children jumped with a fist pump as he went to the car to invite his wife, oldest child, and toddler son inside. At this point, I was more than happy to have a total of nine people! Shortly after, a third family arrived and all my doubt was shoved aside. We had fifteen people total. Fifteen! I was ecstatic! We served the families pizza and I nervously sat down with Mr. Javier's family and asked him about his work and his wife's hobbies. I was afraid the language barrier will shy them away from speaking to me so I kindly asked for his children to translate. I learned that Mr. Javier and his wife has never even heard of the game bingo. I learned about his job and I learned about some of the talents and interests his wife has. I learned about their oldest daughter's passions and strengths in school. I bonded with his two children that are currently in our afterschool program. Oh, how sweet it was to see their faces light up when I would speak to their children! I soon wished I could just sit with them all night and learn more and more about them. But we were running out of time and had a schedule to stick to. My colleagues were also seeking out families and bonding with them. I was blessed to be able to witness something as simple and kind as them laughing with families, attending to their needs, and serving them to the best of their ability. Words cannot express my gratitude for their help! Right as we were about to begin the first round of bingo, more and more families kept trickling in. I was preparing bingo and Sam and Andrew were helping families get settled. At one point all three of us were scrambling the get the new families settled! Our number of the night ended at 37! I was so surprised by the number of families that showed up for our first ever family event! What a joy it was to see families enjoying themselves, talking amongst one another, and playing a fun game of bingo. I was completely overwhelmed by tasting and seeing the effect of an afterschool program that brings families together for one purpose--to see grace and love be extended to them as it was extended to us. Why SOAR? Because SOAR is for the student. Why _____________SOAR? That is a question many people ask themselves for many different reasons. Why should I work at SOAR? Why should I send my child to SOAR? Why should I invest in SOAR? Why should my organization partner with SOAR? The answer to all of the questions above and more is really very simple, SOAR IS FOR THE STUDENT FIRST. Kids who consistently attend SOAR become better leaders in their classroom, home, and community. This happens for a number of different reasons. The first reason is that SOAR hires really great staff members. SOAR staff members truly care about making every single day at SOAR the best possible day for every student. SOAR staff members are committed to being great listeners, prepared instructors, and positive role models for our students. SOAR offers premiere activity options for our students. Activities at SOAR include Theatre Clubs, Football, Goops and Gadgets, Videography & Photography, Woodworking/Building Club, and MANY MORE! The final reason for student growth within SOAR is that SOAR has developed fantastic partnerships with many organizations & schools in the community. Our partner schools of Parson Hills Elementary, Jones Elementary, and Grace Hill Elementary support our program in making sure that the standards of the school day are in line with the standards of SOAR, they assist us with homework time structure, and support our staff through relationships with their staff members. We are also supported by a number of partnerships in the community. Our community partners assist us with volunteer recruitment, program design, curriculum development. Art Feeds, Trike Theatre, CWE365, Camp War Eagle Summer Camp, Ozark Guidance, and the Benton County Child Advocacy Center are just a few of our wonderful partners that support the goals of SOAR. When a student comes to SOAR our hope is that he or she feels accepted, cared for, challenged, and most of all, has a ton of fun. We want to provide each student an opportunity to just be a kid without the pressures of school and without the pressures of whatever life situation they or their family are going through. SOAR is for the student.